Friday night, after the players fold their cards and eat the last chocolate-covered cashew, after Henry has left to drive the old ladies back to the nursing home, is Kay's favorite time of the week. For twenty minutes she has the sanctuary to herself. The quiet soothes her. No television blaring, no Henry bothering her for this little thing or that, no voices or memories filling her head. For a few minutes, she feels a remnant of herself. Her fingers trail through the brass chimes Reverend Martin plays to end the moment of silence. Meditation is the only part of the service she misses, and she wishes anyone other than Reverend Martin delivered that peace. But despite her best efforts, he is still the minister, and when she remembers this, a small stone lodges in her throat and a steel taste fills her mouth. The chimes fade. Kay picks up an empty coffee mug carelessly left on the altar. A cricket, trapped somewhere inside, chirps its melancholic song. Odd, a cricket in December. In the kitchen, she empties the coffee urn and rinses it with warm water. She stores opened bags of pretzels and nuts in plastic tubs and slides them on the highest shelf, safe from mice and Reverend Martin's pesky son who steals them when he comes to church. Brat! If she had children, she never would allow them to run wild through the building, taking what did not belong to them. She finishes in the kitchen and turns off the sanctuary lights. In an instant everything turns into a slate of perfect black and she forgets where she is, who she is, forgets she is in church, and panic clutches at her chest, she is in the closet, the closet, and someone cries, ‘Mama, mama, please', the doorknob does not turn, and she pounds and pounds until her fists ache, the mothball wool of coats drape over her, suffocating. Kay fumbles for the light switch and the room returns—altar, candles, chalice, organ, chairs stacked against the wall, speckled linoleum floor. She breathes again, the stone dislodges. But Kay dislikes the gaudy fluorescence almost as much as the dark, and she deserves her peace, so she opens the drawer of the small table holding the chalice and withdraws the matches. She knows she should not do this, Henry yells at her when she lights cigarettes and candles. But this is her small secret ritual, her way of making good with the god she is no longer sure she believes in. Matches and candle in hand, she returns to the light switch. The room goes black again but this time Kay is not frightened, she remembers where she is. Her eyes adjust. She walks carefully across the sanctuary to the altar. The match flares. The sulphur smell fills the air. Kay touches the flame to the thick white candle nestled in the pewter chalice. 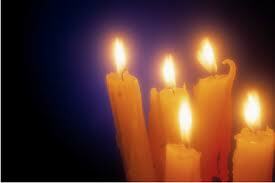 The candle sputters, almost flickers out, but then strengthens. The walls gleam gold. Her shadow wavers, a giant flung against the ceiling. She lights a thinner taper from the chalice candle. For John, she says, my lovely son. She grinds the end of the taper into the bowl of sand, and lights a second. Bill, I miss you, my love. My one true love. The second candle stands beside the first. She considers lighting a candle for her mother. The wick takes, then falters. For Henry, she says, and places the unlit candle in the sand. The warmth from the candles fills her face, fills the sanctuary. For a moment, the world stills. Grace fills her, and forgiveness, even for Henry. Even for Reverend Martin. Her eyes close. Yes, even for Martin. Outside, a horn bleats. Kay rushes for her coat, her purse, her gloves, the Tupperware filled with leftover Chex mix, she is forgetting something, but the horn honks again, Henry hates waiting, and she does not want his ire tonight, not tonight, so she closes the church door and enters the dark. THIRTEEN EXTRAORDINARY THINGS, edited by the fabulous Michelle Elvy and John Wentworth Chapin. A small excerpt from my novel-in-progress THE MINISTER'S WIFE and inspired, of course, by real life. good stuff! love, "a small stone lodges in her throat and a steel taste fills her mouth." Yes - Good piece. Strong writing, Linda. Enjoyed the read. Linda you brought me right into her space, and the movement of space, real and remembered, as she travels from the church kitchen to the sanctuary to the closet flashback. This is awesome work! Linda, Your sense of imagery is so strong and precise - I was there. Wonderful work. Whoops. I meant to type great work. typo.